Researchers measured the largest dead zone since 1985 during their 2017 cruise, with this year’s low-oxygen area totaling 8,776 square miles, larger than the state of New Jersey. Red on the map indicates hypoxia, where the oxygen level is less than 2 parts per million. 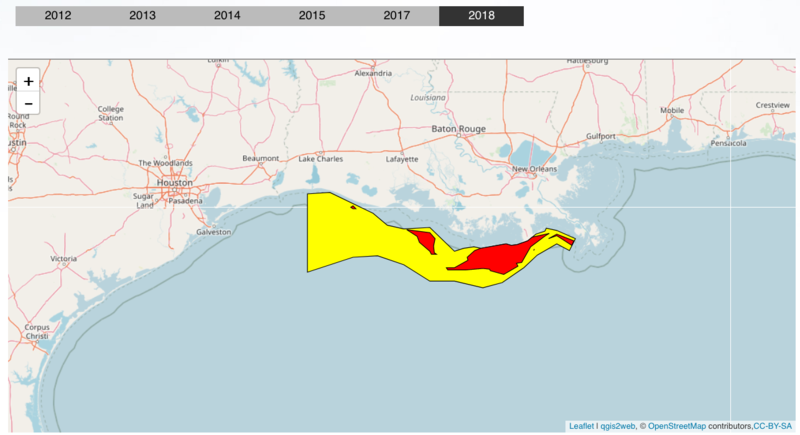 The low-oxygen dead zone in the Gulf of Mexico along the Louisiana and Texas coast this year measures 8,776 square miles, the largest since size assessments began in 1985 and as large as the state of New Jersey, researchers announced Wednesday (Aug. 2). 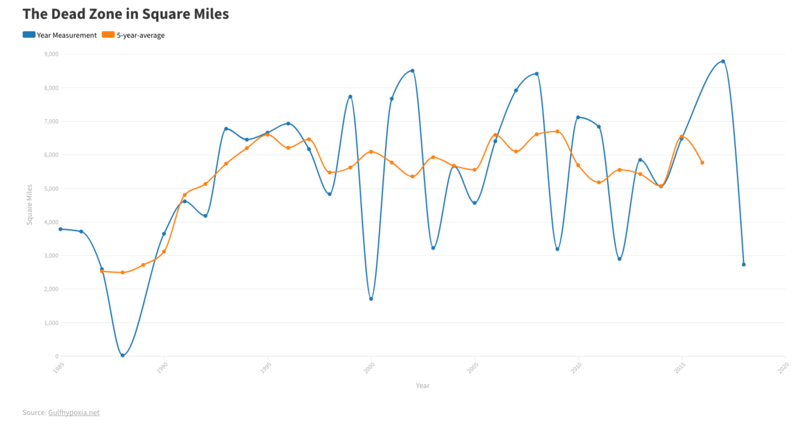 It likely was even larger, but limited monitoring time aboard the research ship during the six-day cruise that ended Sunday hampered the team’s ability to measure its stretch along the Texas coast. 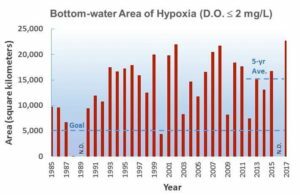 Scientists say this year’s hypoxia zone is 4 1/2 times the size of the goal, about 1,950 square miles, set by the federal-state Mississippi River Nutrient/Hypoxia Task Force. The task force has recommended that the dead zone be reduced to that size by 2035, but in 2001, three years after it was formed, the task force set the goal for 2015. 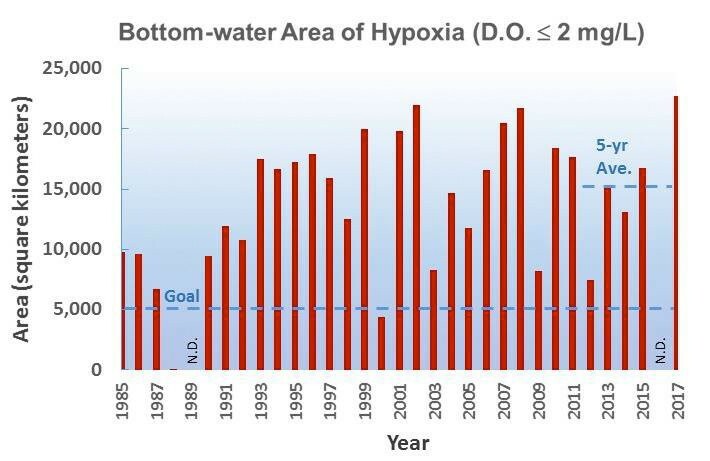 This chart shows the historic size of the low-oxygen dead zone, also referred to as hypoxia, off the coast of Louisiana and Texas between 1985 and 2017. There were no cruises in 1989 and 2016. Hypoxia is the scientific term for water containing less than 2 parts per million of oxygen. 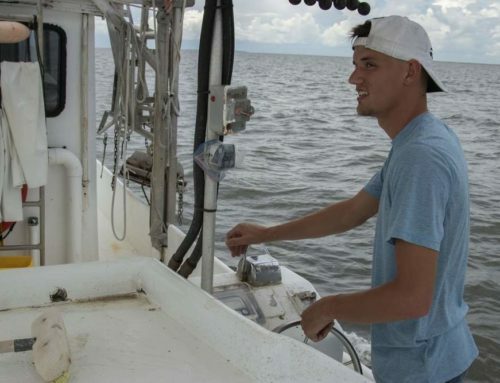 It is known to kill organisms living in bottom sediments along the northern Gulf Coast, and recent research has shown that it also increases the price for some commercial fish catches, including shrimp, because the shrimp and fish stay out of the low-oxygen water, requiring fishers to travel farther to catch them. 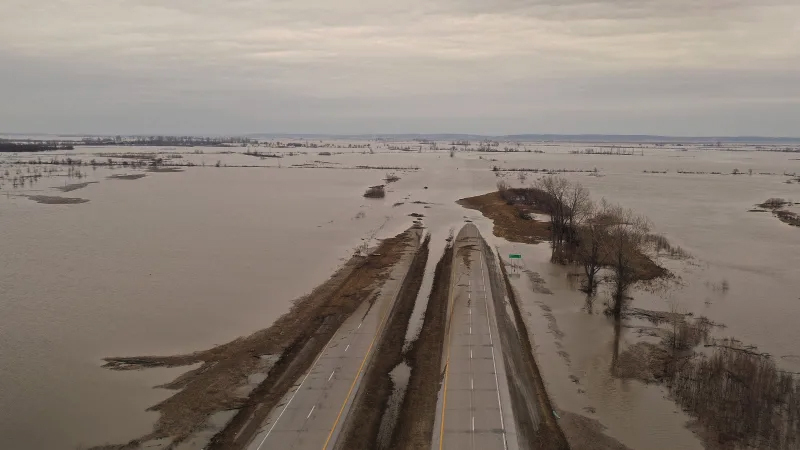 Nitrogen and phosphorus pollution enters the Mississippi throughout its watershed, which includes runoff from the Midwest cropland and factory livestock and chicken farms, as well as pollutants from sewer systems and septic tanks in other locations. About 30 percent of the Mississippi’s water travels down the Atchafalaya River to the Gulf. 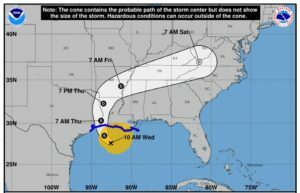 Tropical Storm Cindy cut north across the Gulf Coast at the Louisiana-Texas border on June 21 and 22. Researchers say it helped mix upper level water containing more oxygen with hypoxic water at the Gulf floor near Houston and just off Terrebonne Bay. The lighter freshwater containing the nutrients creates a layered effect when it reaches the Gulf, and the nutrients trigger blooms of phytoplankton, or microscopic marine algae, in the spring and summer. “The fresher, warmer water in the upper layer is separated from the saltier, colder water in the lower layer, resulting in a barrier to the normal diffusion of oxygen from the surface to the bottom,” the news release said. When the algae dies and sinks to the bottom, it decomposes, using up oxygen in the deeper heavy saltwater and creating dead zone conditions. Those conditions don’t change until wind or weather, especially tropical storms or hurricanes, mix the freshwater at the surface into the saltier water. 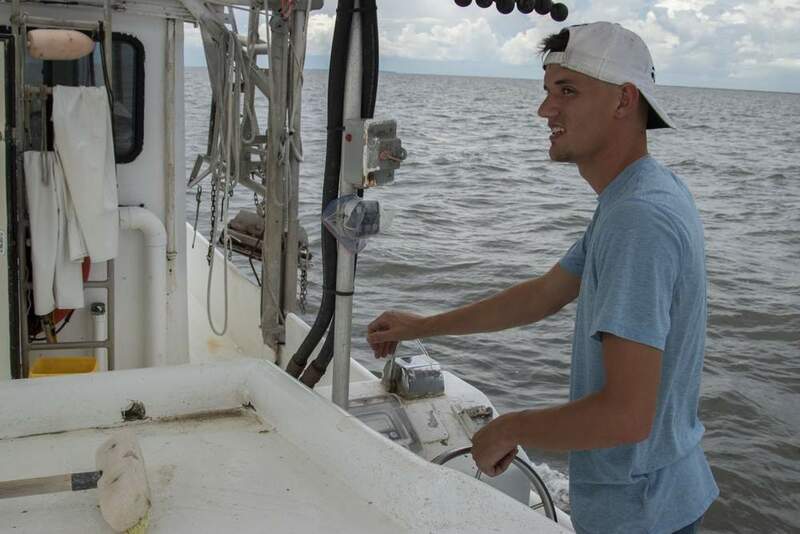 The monitoring cruise, led by LSU marine scientist Nancy Rabalais, found a solid band of water along the Gulf bottom with levels of less than 2 parts per million. It stretched from just west of the mouth of the Mississippi River in Louisiana well into the Texas coast area near Houston. 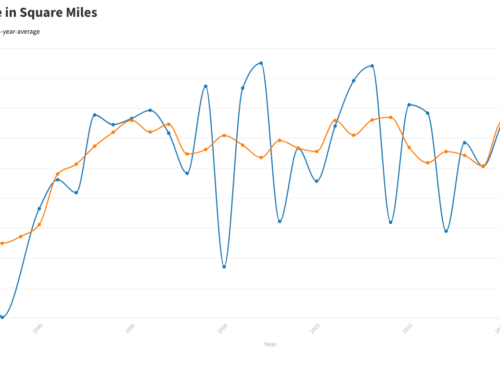 May nitrogen loads from the Mississippi and Atchafalaya rivers for total nitrogen (TN), nitrate plus nitrite nitrogen (NO), and bioavailable nitrogen, which includes NO ammonia and 12% of organic nitrogen. In that band, the oxygen level was often less than a half a part per million or close to zero, also described as anoxia, or a lack of oxygen. And the researchers found that the low oxygen levels were present well up in the water column, closer to the surface, in the eastern part of the mapping cruise. 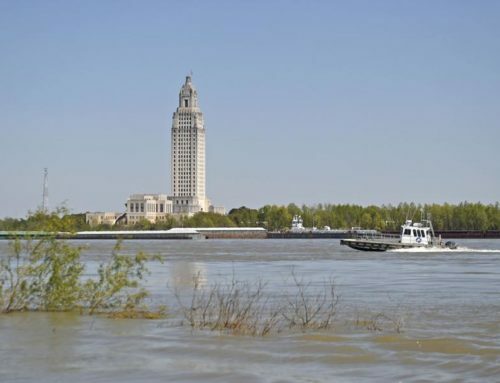 LSU and Louisiana University Marine Consortium researchers had estimated this year’s cruise would show an even larger area of hypoxia — 10,089 square miles — based on the amount of nitrogen compounds carried by the Mississippi River in May. 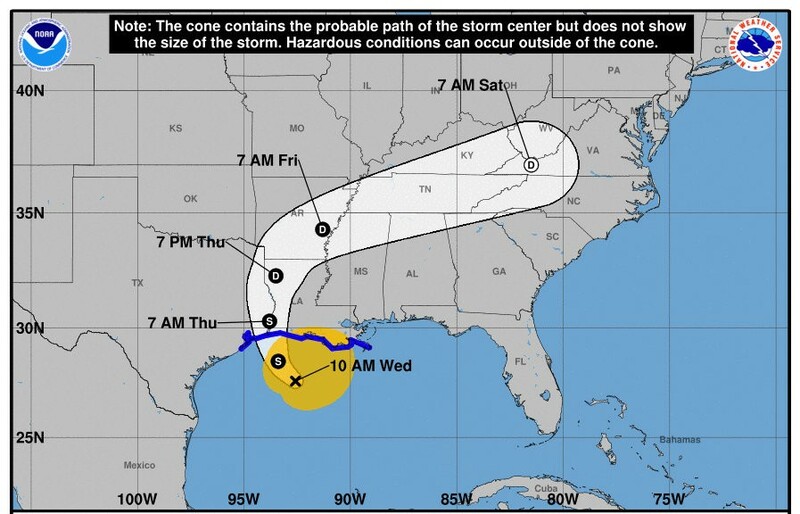 The large area of low oxygen occurred despite some mixing of surface and deeper water as Tropical Storm Cindy crossed the coastline at the Louisiana-Texas border on June 21 and 22. 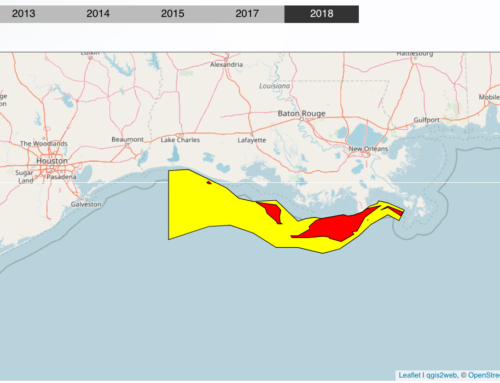 Some disruption of hypoxic conditions was measured by researchers with a National Marine Fisheries Service survey off Galveston Bay and Sabine Lake near the state border, and off Terrebonne Bay after the storm passed, according to the researchers’ news release. 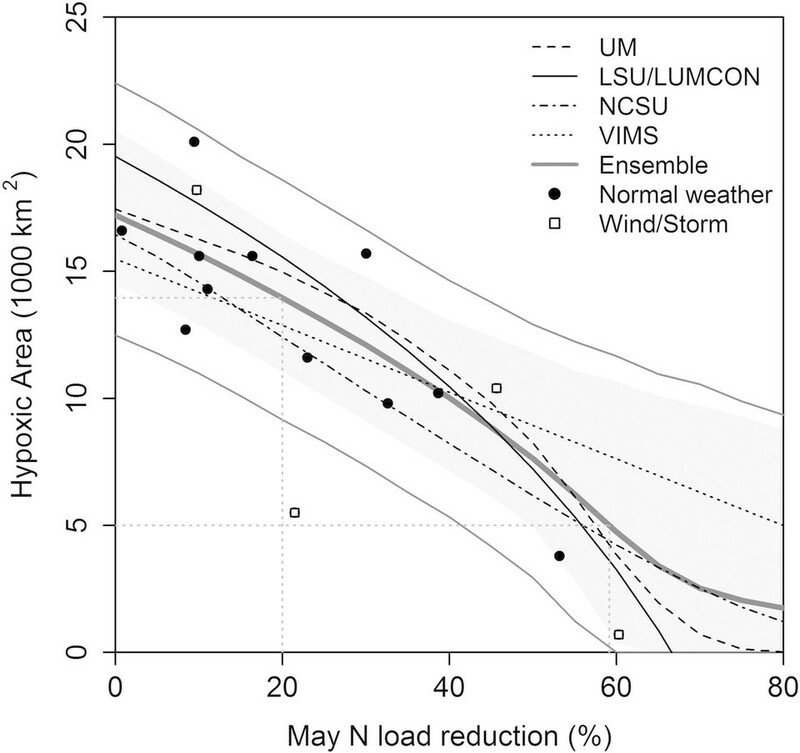 This graph shows the percent reduction in May nitrogen load predicted by different models as required to reduce the dead zone below the 2035 goal of 5,000 square kilometers, or 1,950 square miles, recommended by a federal-state intergovernmental task force. That task force originally recommended that goal be met by 2015. The bold black line represents the reduction predicted by an ensemble of all the models. The amount of nutrients entering the river rose beginning in the 1960s, the result of more intense agricultural activity, including the increased use of fertilizers, especially in the Midwest. 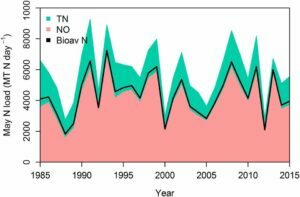 The amount of nitrogen entering the river has stabilized over the past 20 years, but the nitrate portion of the total nitrogen load has increased, the researchers said, and studies have shown a relationship between the amount of nitrate and the size of the algae blooms. The hypoxia task force has for years been part of a national effort to reduce the amount of nutrients used in farming operations through voluntary methods, including grants through the U.S. Department of Agriculture to encourage modern methods of applying nutrients to crops and moving marginal land out of agriculture and back into wetlands, which can absorb nutrients before they end up in rivers and streams. But in their report on this year’s dead zone, the researchers said its size also can be affected by nutrients that are stored in sediment and then released, carried over from one year to the next. Meanwhile, a new study says the chances of the hypoxia task force meeting its 2035 reduction goal through its voluntary nutrient reduction strategy is unlikely to be successful. 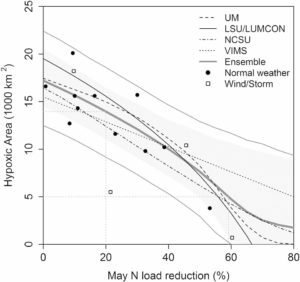 Researchers used four computer models to determine that there would have to be a 59 percent reduction in the amount of nitrogen runoff flowing down the Mississippi to meet that goal. “The bottom line is that we will never reach the action plan’s goal of 1,950 square miles until more serious actions are taken to reduce the loss of Midwest fertilizers into the Mississippi River system,” said University of Michigan aquatic ecologist Don Scavia, lead author of the paper published Monday in the Proceedings of the National Academy of Sciences. The study’s authors are from the University of Michigan, North Carolina State University, Louisiana State University and the College of William & Mary. 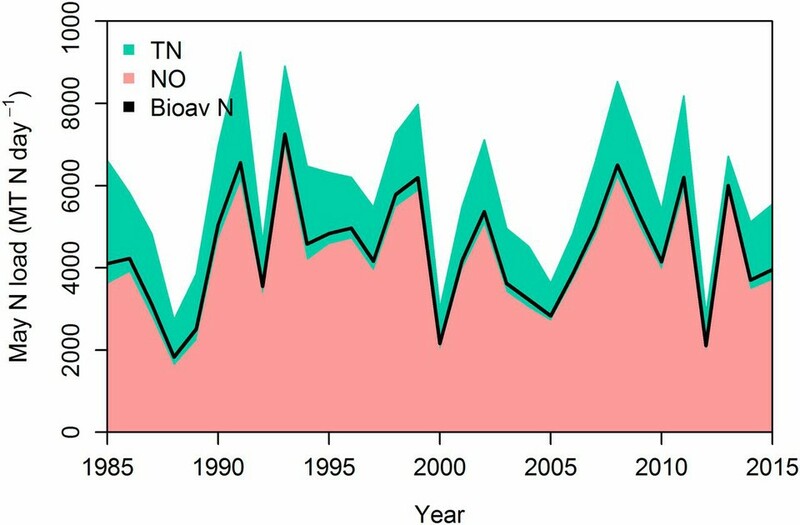 The current five-year running average of the nitrate load delivered to the Gulf has changed little from a 1980-96 baseline, according to the study, despite U.S. Farm Bill conservation programs having spent more than $28 billion in the 20 Mississippi Basin states since 1995. 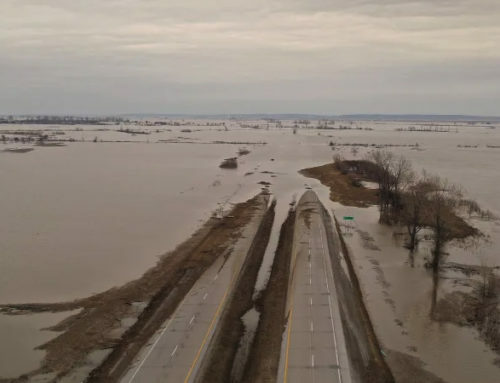 However, federal officials have repeatedly refused to set numerical limits on the release of nitrogen and phosphorus into the Mississippi River from farmland, and the task force also has avoided considering such goals, most recently at a meeting in New Orleans in December. The task force includes representatives of the U.S. Environmental Protection Agency, the Army Corps of Engineers and the departments of Commerce, Interior and Agriculture, and representatives of 12 states in the main part of the Mississippi’s watershed: Arkansas, Illinois, Indiana, Iowa, Kentucky, Louisiana, Minnesota, Mississippi, Missouri, Ohio, Wisconsin, and Tennessee. The National Tribal Water Council represents tribal interests. Environmental groups active along the river and its tributaries, including the New Orleans-based Gulf Restoration Network, have petitioned the EPA to set limits on “non-point” runoff pollution since 2008, and sued the agency in 2012, when it refused to do so. In 2013, U.S. District Judge Jay Zainey sided with the environmental groups, saying the agency should have conducted a “necessity determination,” an analysis that might have triggered new standards. But Zainey’s ruling was overturned in 2015 by the U.S. 5th Circuit Court of Appeals, which ruled EPA had the discretion to not conduct the study. In December, Zainey rewrote his opinion to comply with the appeals court ruling.